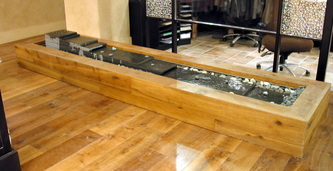 This Flowing River water feature offers a creative touch to an actual flowing river. As water runs across stacked pieces of slate, it glistens across the texture before cascading down each level and eventually spilling into the riverbed of pebbles. 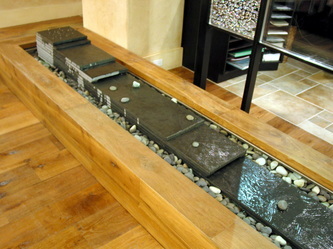 Simple, yet beautiful, the combination of pebbles and slate creates a holistic state of serenity. The acoustics of the running water resemble a flowing river while the design of the water feature offers Feng-shui inspiration.